At Move 4 Less sometimes we’re too busy to just stop and think about the hard work that goes into each and every customer move, and all the care and attention we take to make sure everything happens on time and as promised. We try to make sure that each customer experience is as good as we’re trying to make it, and we welcome and review all the feedback we get. We always keep trying to do even better. So when we got a bit of recognition for what we consider our everyday job, we decided to take time to stop and appreciate it. 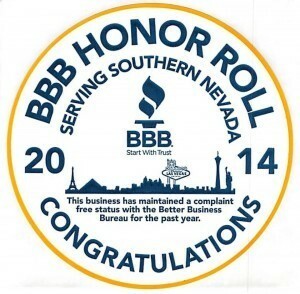 Our entire Las Vegas team was pleased to be notified that Move 4 Less was put on the Better Business Bureau (BBB) Honor Roll for 2014. A business can only get this award by having zero complaints for the year. We are proud to say not only did we meet that hurdle, but we have an A+ rating from the BBB, too. This honor is a reflection of our company culture and the efforts of all our hard-working employees. We are reminded daily that the move we are working on is the most important move that day, that each step must happen correctly and on time, and that we all must work together to make each move a success. Our focus on customer care has allowed us to achieve another milestone. Move 4 Less was pleased to receive Better Business Bureau Accreditation status in 2013 and we continue to hold that designation. This means we’ve met their standards for quality service to our clients based on a number of important criteria. Among the many quality standards we demonstrated to earn the BBB Accreditation are honoring our promises, being responsive to our customers, and making sure any problems are satisfactorily resolved. We have made a commitment to ourselves and our clients to be the most trusted mover in Las Vegas, and all of us at Move 4 Less work at meeting that goal every day, with every move we undertake. Three Best Rated, a rating service that evaluates companies across the country for a variety of quality factors, has chosen Move 4 Less as one of the top three moving companies in Las Vegas. They consider factors like ratings and reviews, customer satisfaction, cost and overall excellence. We spend a lot of time on issues like keeping our clients’ costs down and making sure we meet or exceed their expectations for our moving, packing and storage services, so we appreciate being recognized for our efforts to deliver only excellent service to our Las Vegas customers. Our company culture is built around our client experience, so we’re very pleased that we’ve been recognized by the BBB and reviewers like Three Best Rate. This confirms to us that the Las Vegas community has come to recognize our years of working very hard to be the very best moving company in Las Vegas. We don’t plan to change that any time soon. We’re so used to making sure that every call is answered, every move quote is done right, every appointment is met, and every move completed with professionalism and care, that we have no intention of changing that, except to do even better. We appreciate the trust our clients put in us and we plan to continue earning it with each and every move for our Las Vegas neighbors. Summer Moving in Las Vegas Looking for a Moving Company in Las Vegas you can Trust?